The cucurbits are a family of vining plants that includes cucumbers, squash, pumpkins, watermelons, melons, and gourds. All edible plants from this family are actually fruits, deriving from the ovary of a pollinated flower, even though we might call them a ‘vegetable.’ Most have separate male and female flowers. Cold injury (low temperature) on cucumber. 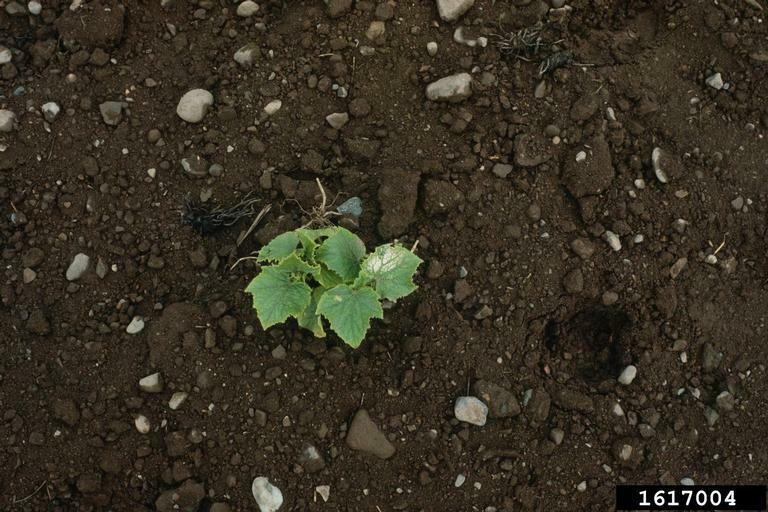 This can have many causes, but some of the most common are: 1) Planting cucurbits too early. 2) Wrong plant in the wrong place. Cucurbits prefer loose, fertile, medium textured, organically rich, slightly acidic, well-drained soils in full sun. 3) Overwatering or underwatering. Too much water robs the soil of the oxygen required for healthy root growth, while too little robs the roots of the moisture required for healthy root growth. Cold injury to honeydew melons. Generally, cucurbits should only be planted when the soil is thoroughly warmed in spring, usually the end of May in the St. Louis area. Temperatures below 63 degrees F will delay seed germination, while plants set out too soon will be dwarfed. Cold injury late in the year can result in dead spots on leaves and fruit. 1. Root rot: Too much water robs the soil of the oxygen required for healthy root growth and injures the roots. Any injury to the roots can provide an entry point for bacterial rots and water molds, such as, Pythium or Phytophthora. 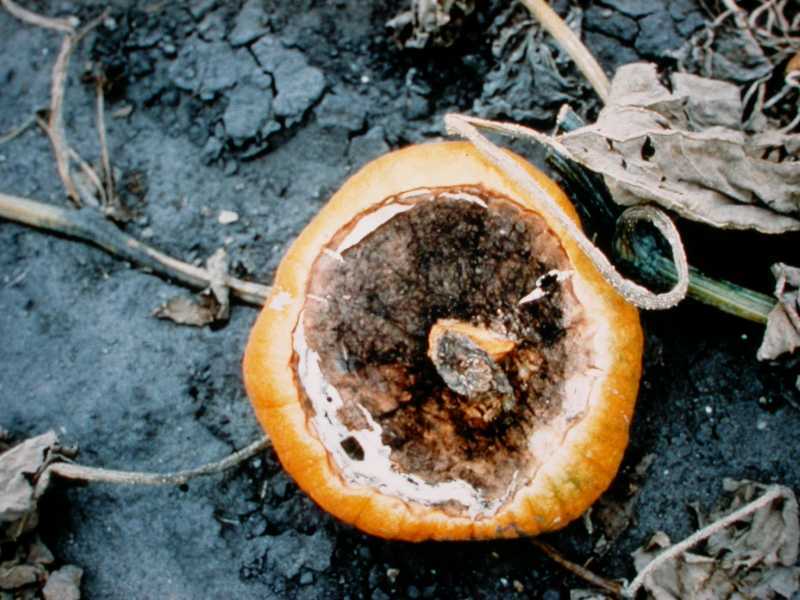 Infected plants typically wilt and die. This is a physiological disorder that develops when roots take up water faster than it can be used by the plant or transpired through the leaves. Water pressure builds up in the internal cells causing them to burst, leaving dead cells that are visible as blisters. Squash plants wilting from drought. Too little water robs the roots of the moisture required for healthy root growth while too much water robs the soil of the oxygen required for healthy root growth. Plants wilt and may die. A common problem of cucurbits is that they flower but they do not set any fruit. If this occurs early in the season, it may be due to cold, rainy weather. However, the most likely reason is that the plant's female flowers have not yet begun to open. 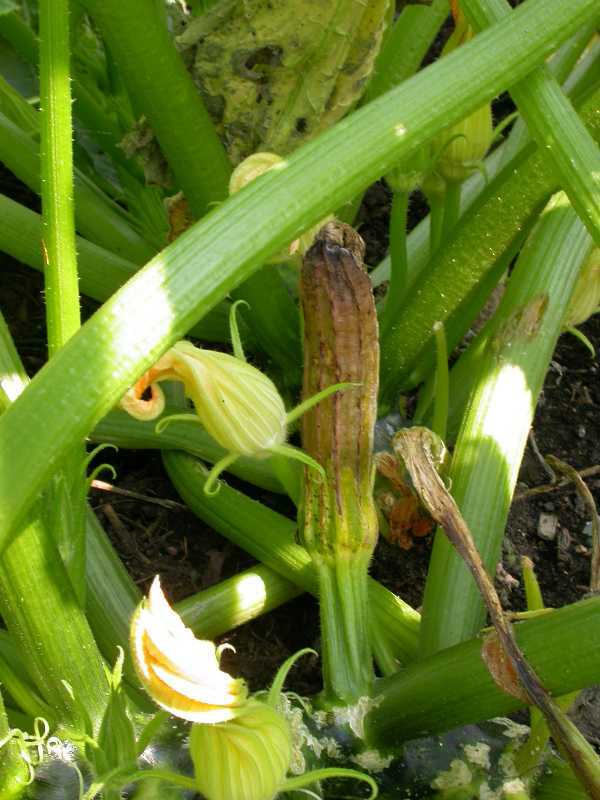 Since most cucurbits produce separate male and female flowers, it is imperative that both be open at the same time for pollination to take place. Generally, male flowers start to open first followed by female flowers. Lack of proper pollination in the summer, even though both male and female flowers are present, may be caused by a lack of insects for proper pollination or by temperatures above 90 degrees F.
2) Avoid pesticides that kill pollinators or if you must apply pesticides, do it after the flowers have closed for the day. 3) Hand pollinate. 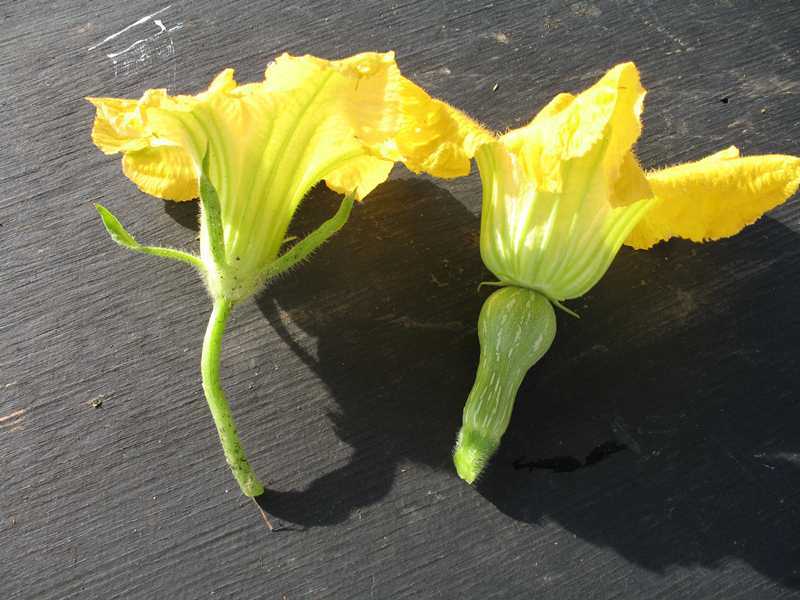 To learn how to distinguish male flowers from female flowers and/or to learn how to hand pollinate, see: Hand pollination of squash and pumpkins. Another common problem is misshapen or rotting fruit. 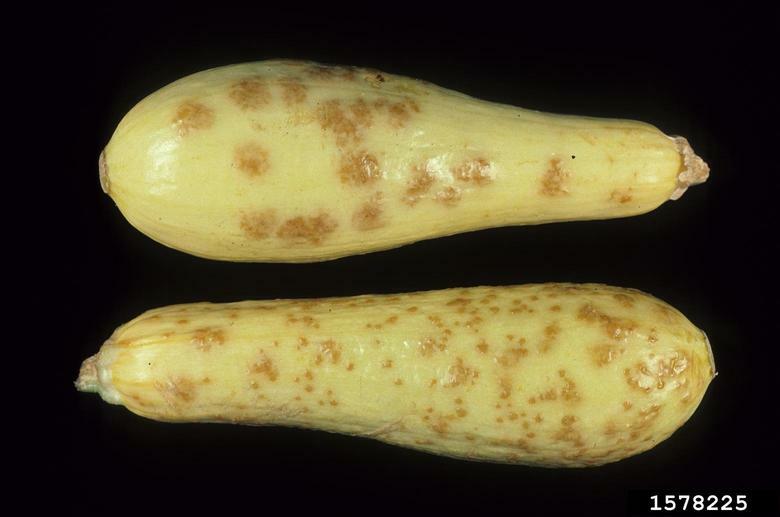 Both can be caused by incomplete pollination or environmental stresses. Environmental stresses include fluctuations in soil moisture, rapid growth followed by extended dry weather, excess rain which kills roots or a salt build up in the soil. Maintaining more uniform soil moisture through the use of mulch can help reduce environmental stresses. Incomplete pollination can be a side effect of using pesticides that kill pollinators or it can be caused by a general lack of pollinators in your garden. If pesticides are needed, put off applying chemicals until late in the day when the flowers have closed. Or if pollinators are lacking, either hand-pollinate or incorporate plants in your garden that attract pollinators. Blossom end rot, which begins with a small watery bruise on the blossom end of the fruit, is the result of a lack of calcium in developing fruits. 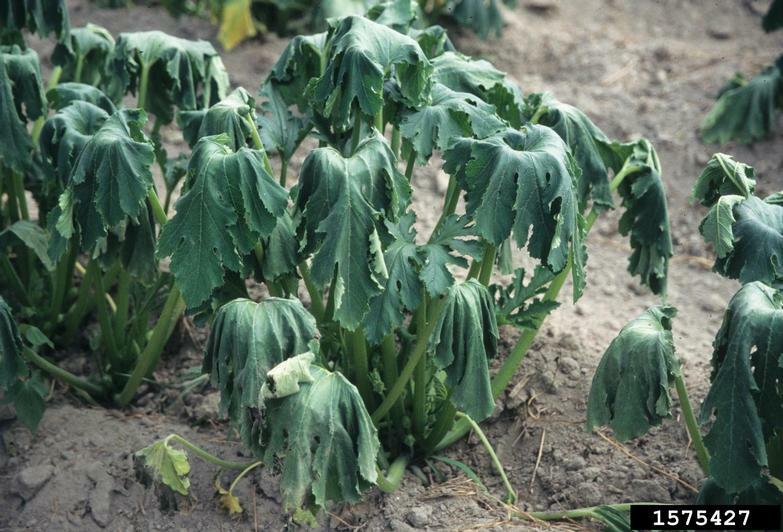 This calcium deficiency can be a result of extreme fluctuations in soil moisture, an excess of salts, or other fluctuating conditions during plant growth. Calcium deficiencies cause actively growing cells to die because they cannot retain water and nutrients. It is most common in watermelon and some squash. Magnesium deficiency on honeydew melon. Nutrient deficiencies can produce many different symptoms. The best way to determine if a nutrient deficiency exists is to have a complete soil test. But be aware that root injuries and a soil pH that is too high or too low can prevent plants from taking up the water and nutrients that they require. FAQ: How do I test my soil? Too much of certain nutrients can be worse than too little. Remember: you can always add more nutrients but once in the plant or in the soil, you can't take them away. A complete soil test will take away the guess work. FAQ: Is my soil safe for growing vegetables? Cucurbits generally prefer somewhat acid soil (between 6.0 and 6.5). Lower soil pH (below 6.0) can exacerbate nutrient deficiencies (e.g., magnesium and molybdenum) and toxicities (e.g., manganese). However, alkaline soil (above 7.0) can also cause problems. A soil test is a must before applying lime (raises the pH) or sulfur (lowers the pH). Although there are many exceptions, St. Louis area soils usually test around neutral pH (7.0) or alkaline (pH greater than 7.0). Cucurbitacin is a naturally occurring chemical found mostly in the leaves, stems and roots of cucumbers. When it spreads to the fruit, it can cause the fruit to taste bitter. 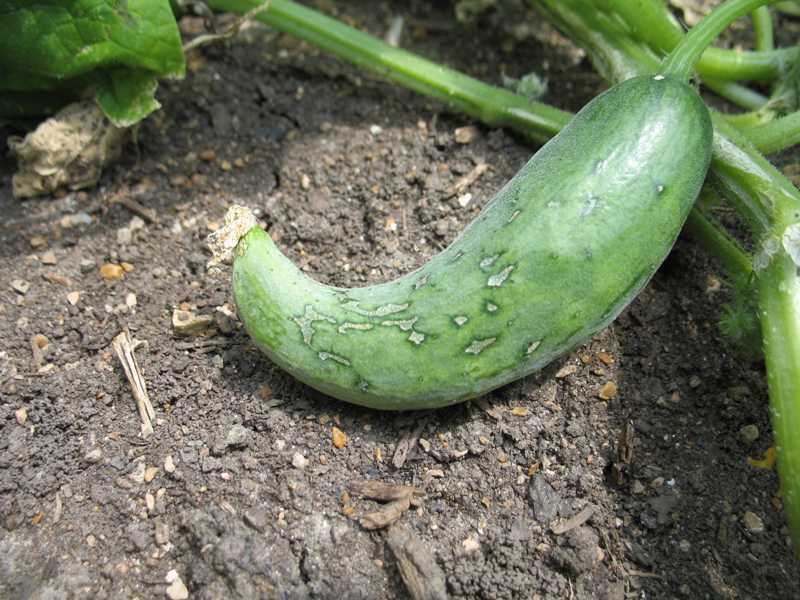 This is especially true for misshapen fruit or for cucumbers harvested from vines that are under stress; such as, from drought or cold weather. Warning: Bitter tasting squash can be dangerous if consumed in sufficient quantities. Black walnut, a common tree in Missouri, produces a valuable wood and delicious nuts. Unfortunately, the tree often causes problems for gardeners. Both black walnut and its close cousin, the butternut, produce a substance called "juglone". This substance ends up in the soil around the tree roots and inhibits growth of many kinds of plants, including cucumbers. Fortunately, however, squash and melons are generally unaffected and can be grown within the root zone of a walnut. 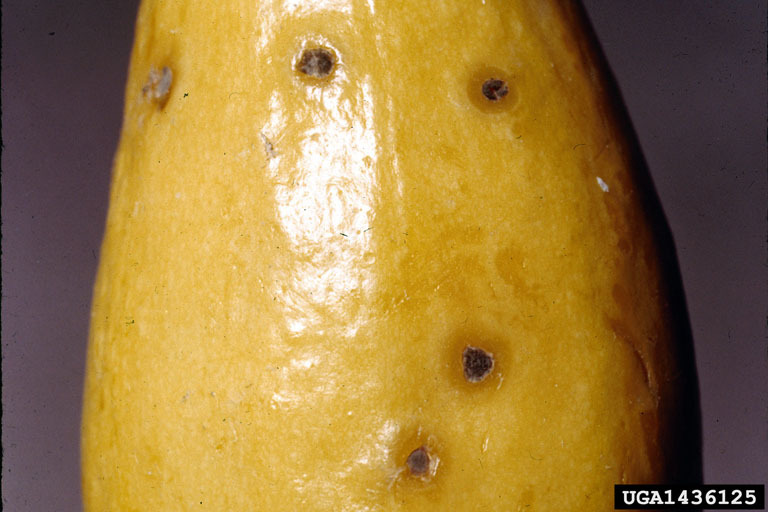 The squash vine borer is a serious pest of both summer and winter squash. 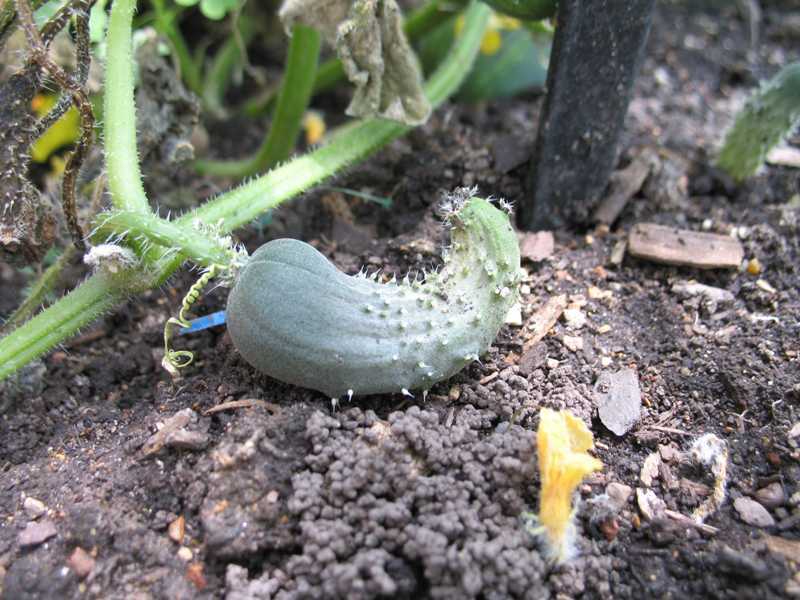 The insect will also attack cucumbers, pumpkins, muskmelons, and watermelons. The first symptom is generally wilting of part or all of the plant. At the base of the plant, moist, sawdust-like debris (frass) can be seen piled outside small holes in the stem. 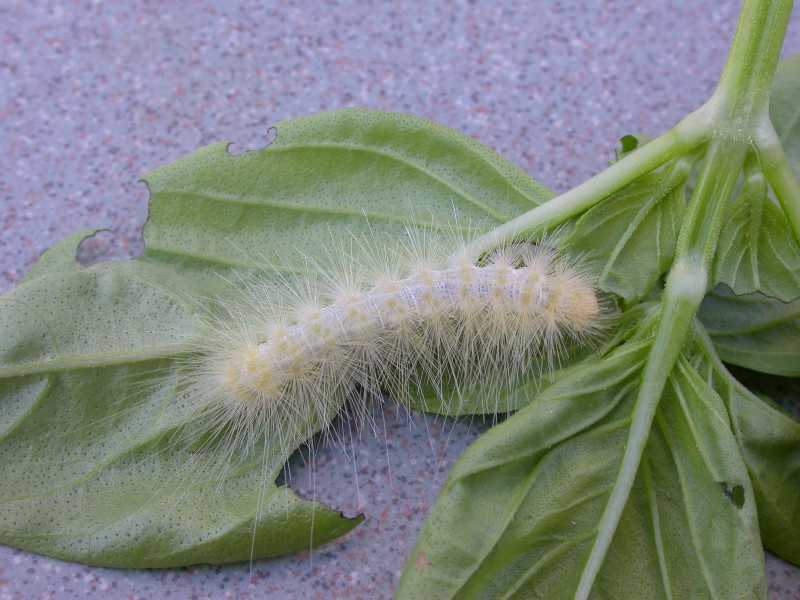 If the stem is split lengthwise, frass and one or more fat, white caterpillars can be found tunneling in the stem. 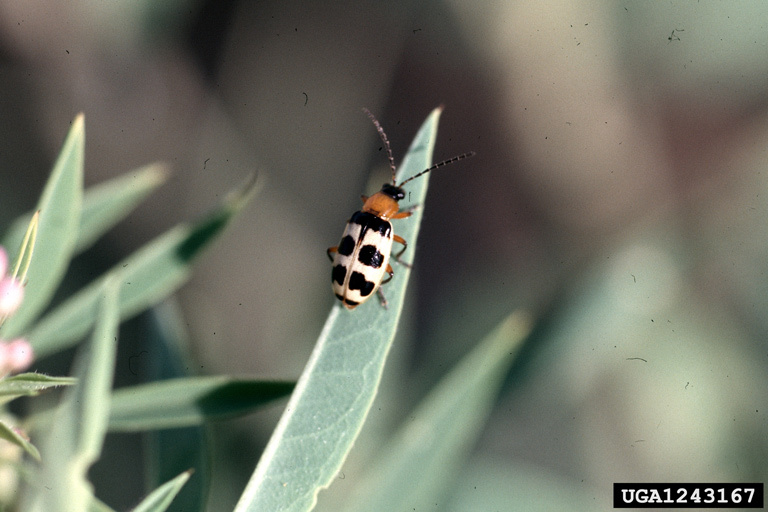 Cucumber beetles may be either spotted or striped. They feed mainly on the foliage and flowers and can completely devour small plants. Their greatest damage, however, results from transmission of bacterial wilt, a lethal disease which results in wilting and death of the plant. The disease itself is discussed later. 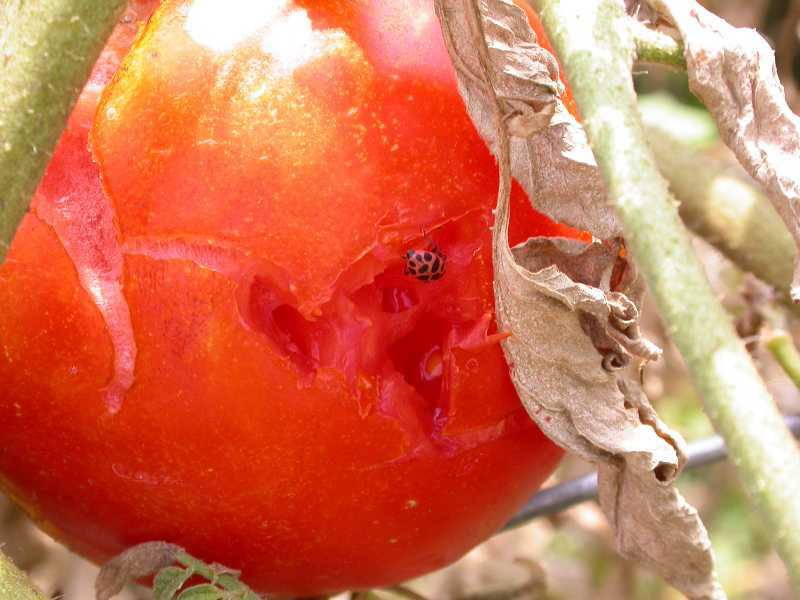 Control of these beetles is critical to preventing the disease. Most species in the lady beetle family are beneficial predators but there are a few exceptions, including the squash beetle. 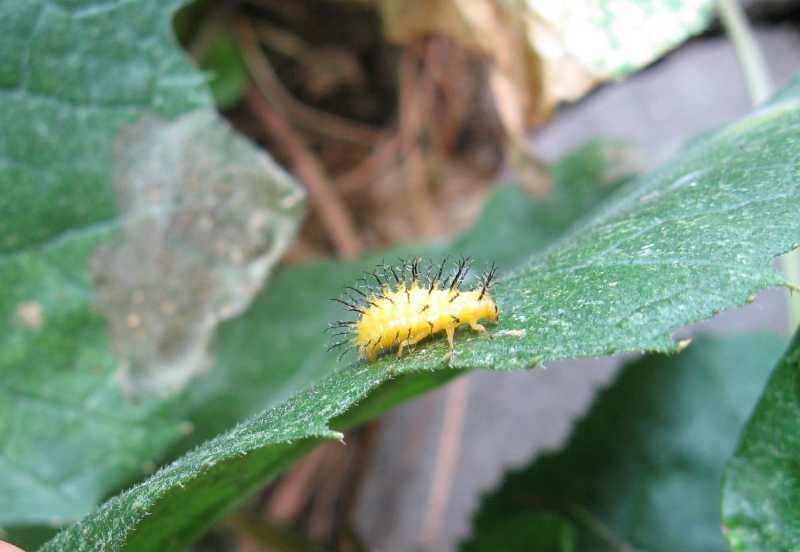 The adult and its spiny larvae eat the leaves of squash, cantaloupe, and other cucurbits. 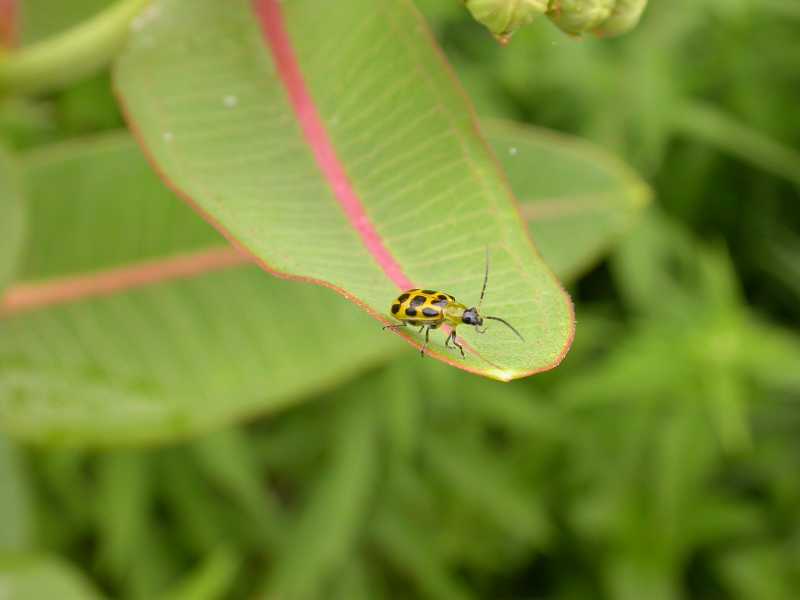 An unusual characteristic of this insect is that the larvae cut a trench on the underside of the leaf to isolate the area in which they are going to feed. 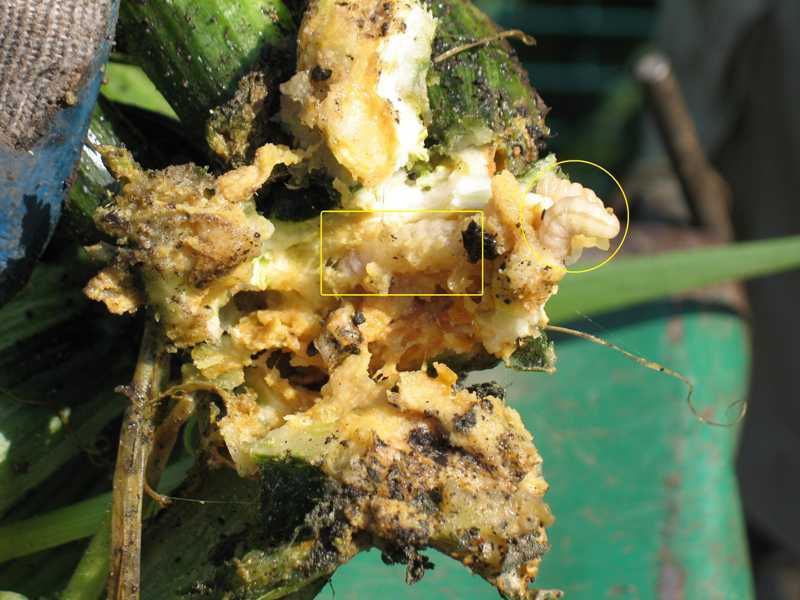 Purdue Extension publication E-100-W, "Squash beetle on cucurbits"
Beetles and the many subheadings under it. Squash bugs are a kind of leaf-footed bug but lack the characteristic leaf foot. They and other leaf-footed bugs are pests of all cucurbits. They destroy plant tissue by sucking out the sap from leaves and stems and depleting nutrients from the plant. This causes leaves to wilt, turn brown and dry out, eventually turning black and falling off the vine. Adults can be seen feeding on main stems. 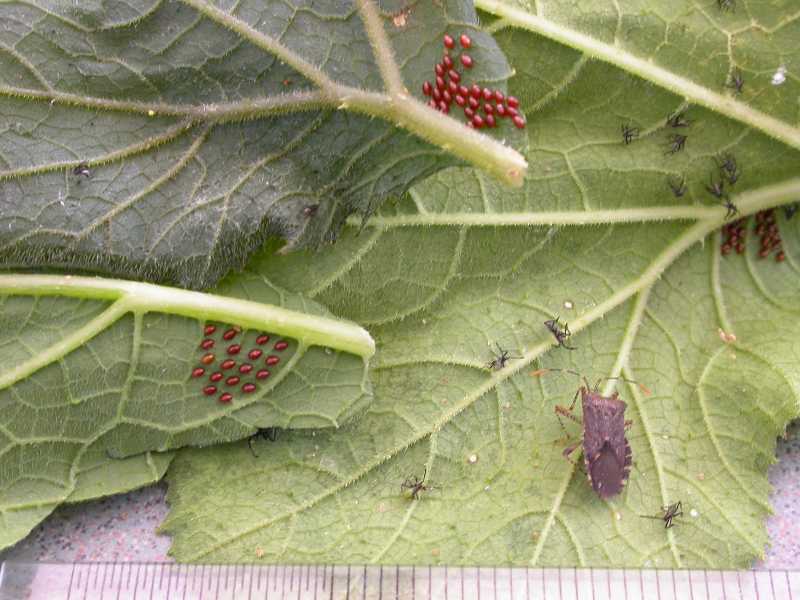 Nymphs and clusters of red-orange football-shaped eggs are usually found on the undersides of leaves. Leafhoppers feed on foliage and shoots of many different plant species by piercing the plant cells and sucking out the contents. 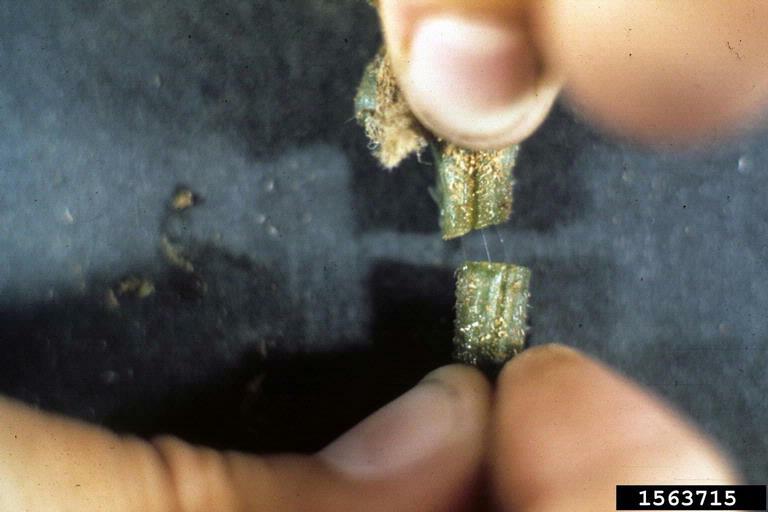 The damage that results depends on the host plant and the specific hopper. A few transmit diseases, such as, beet curly top virus (BCTV). Birds normally bring far more benefits than grief to gardeners because they eat large numbers of insects. However, they sometimes can be a problem for vegetable gardeners, especially when melons or corn are grown. Melons show wounds that appear to have been made by very small daggers in the rind, with sizeable holes often evident, exposing the pulp. Other animals also eat cucurbits, e.g., turtles, raccoons, rabbits, squirrels, deer, etc. 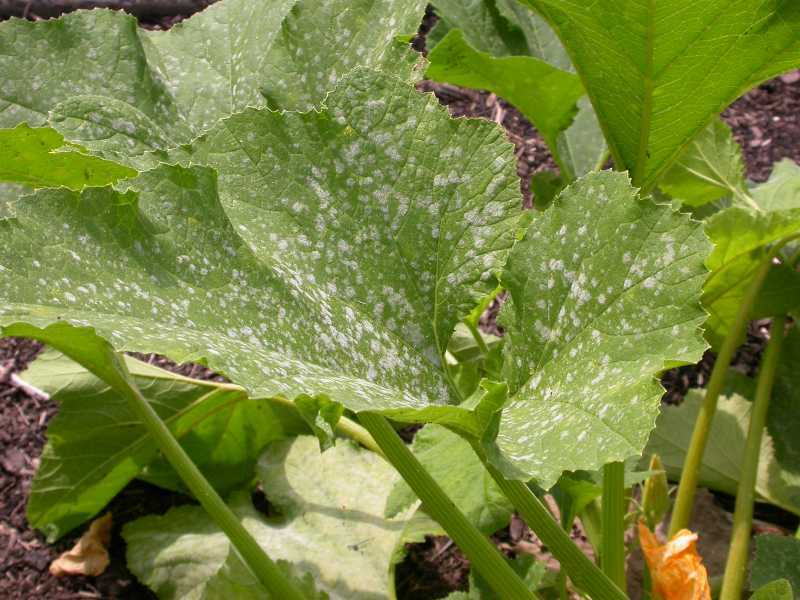 Downy mildew on winter squash leaves. 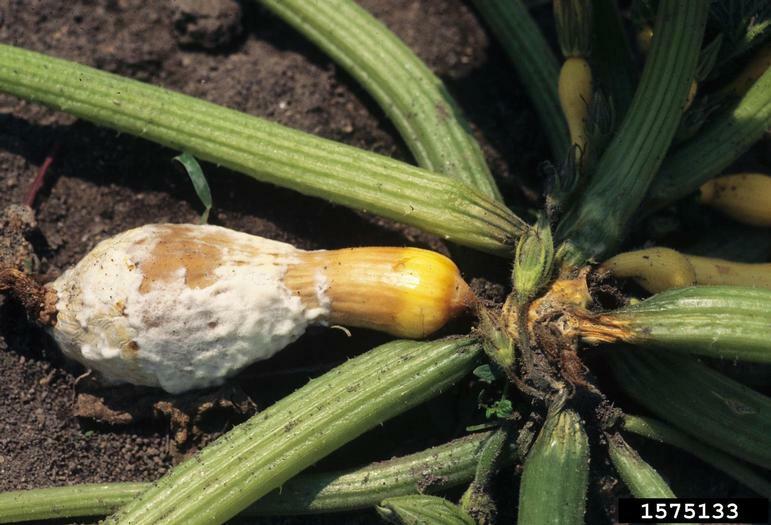 Many different fungal disease can affect cucurbits. Fungicides are available to prevent some fungal diseases but not all. Also, keep in mind that fungicides cannot cure fungal diseases--they can only prevent them, so they must be applied before infection occurs or to prevent further spread. 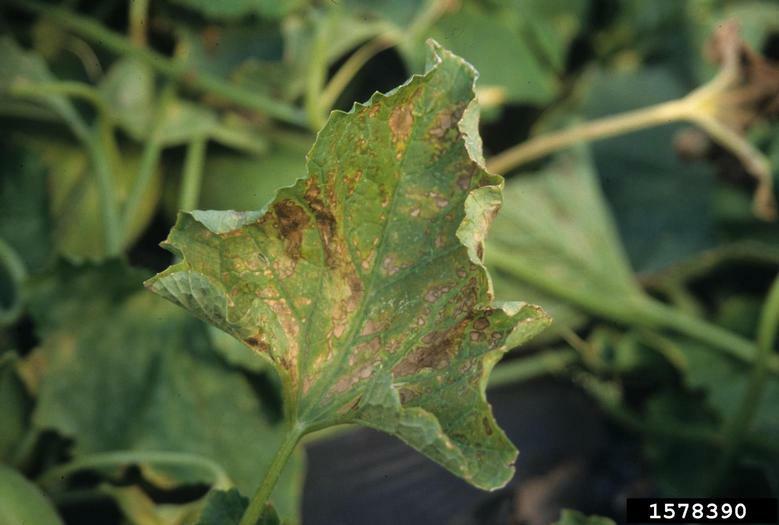 Alternaria leaf blight: Yellow lesions expand to dark brown necrotic (dead) areas. Eventually causes leaf death. What to do: Rotate crops. Anthracnose: Brown-colored leaf spots. Elongated sunken cankers on stems. Sunken circular cankers with pink centers and brown margins on fruit. What to do: 1) Use treated seed. 2) Plant resistant varieties. 3) Rotate like crops. 4) Tillage to bury crop residue. 5) Limit overhead irrigation. 6) Avoid working among wet plants. 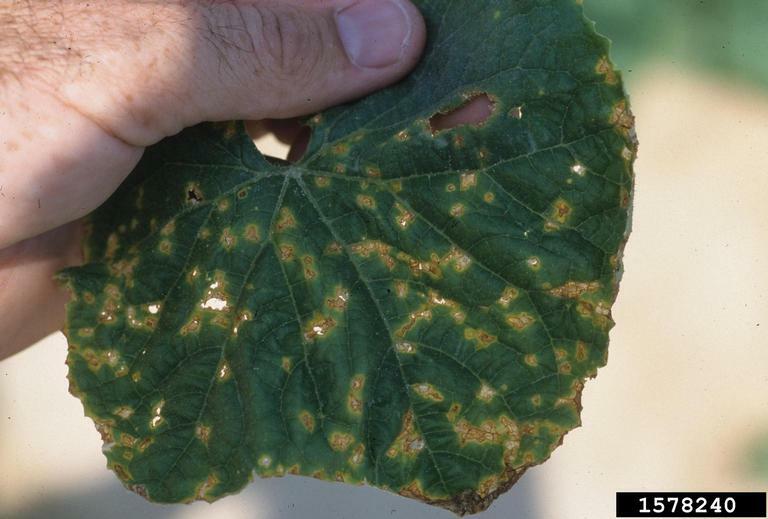 Downy mildew: Yellowish angular spots on upper leaf surface. White to purplish downy growth on lower leaf surfaces. Leaves may curl, turn brown and die. What to do: 1) Plant resistant varieties. 2) Limit overhead irrigation. Fusarium wilt: Vines turn yellow and wilt around fruiting time. Vascular tissues of stems appear discolored and may ooze sap. 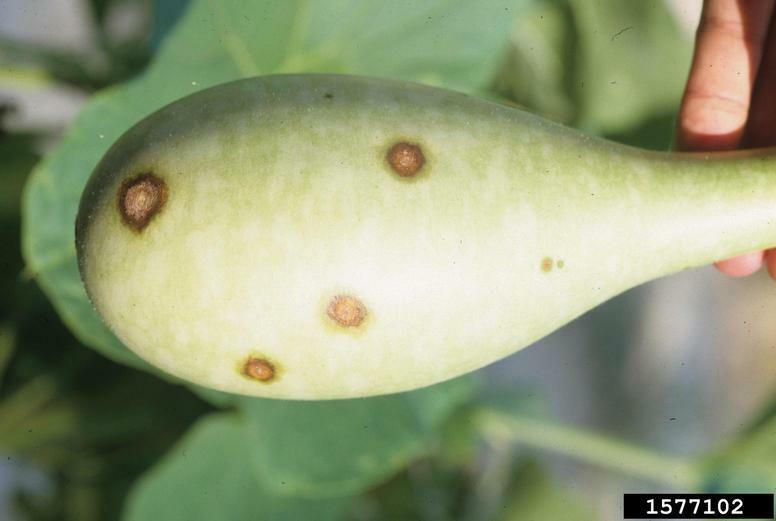 This disease is more prevalent in muskmelons and watermelons. What to do: 1) Use a three-year rotation. 2) Plant resistant varieties. 3) Sanitation. Gummy stem blight: Plants wilt. Water-soaked lesions on leaves and stems turn dark brown. Cankers girdle stems. Cankers have brown, sticky exudate. What to do: 1) Rotate crops. 2) Use disease-free seed. 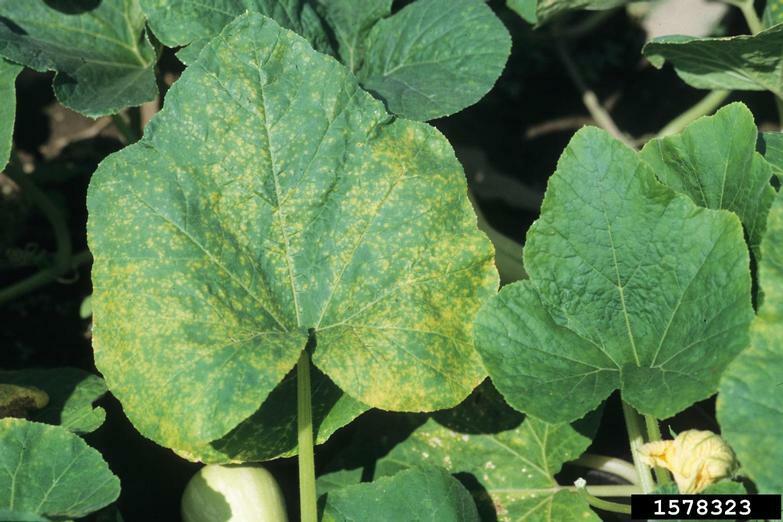 Powdery mildew: Yellow or brown spots on upper side of leaves, underside is covered with white, powdery fungal structures. What to do: 1) Rotate crops. 2) Tillage to bury crop residue. 3) Limit overhead irrigation. 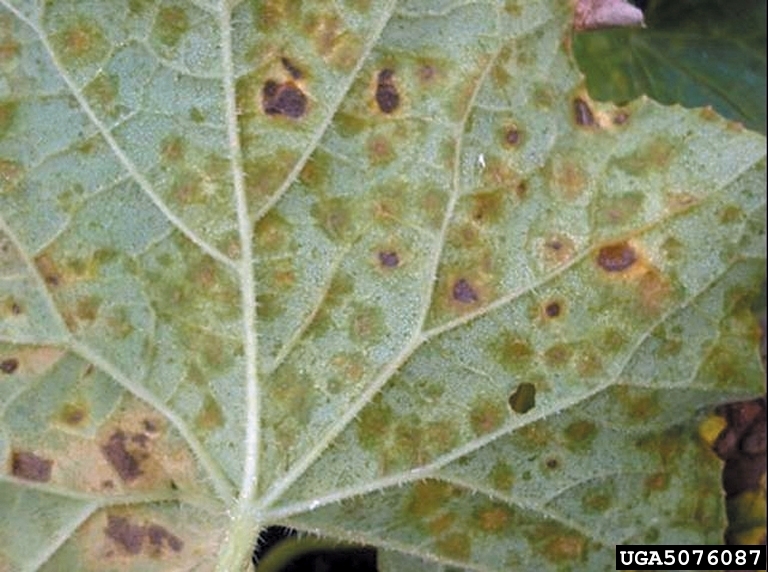 Scab: Occurs on pumpkin, cucumbers, melons, potatoes, squash and beets. 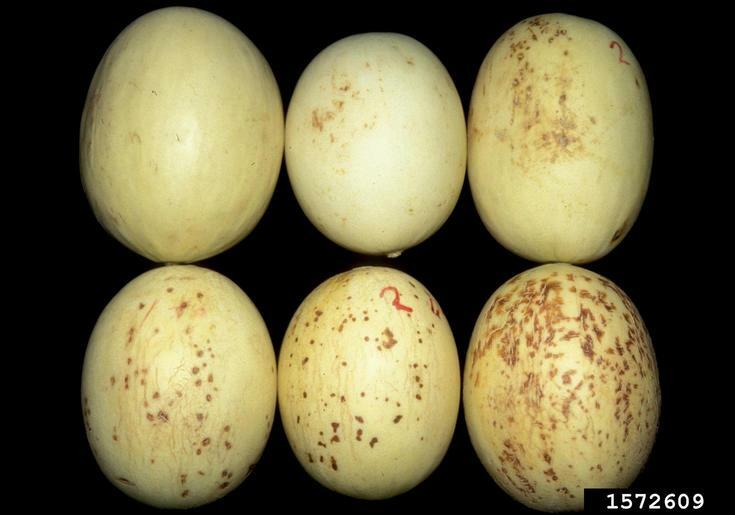 Corky lesions or spots on the surface of the fruit and spots on the leaves. 1)Use treated seed. 2) Plant resistant varieties. 3) Rotate like crops. 4) Sanitation. 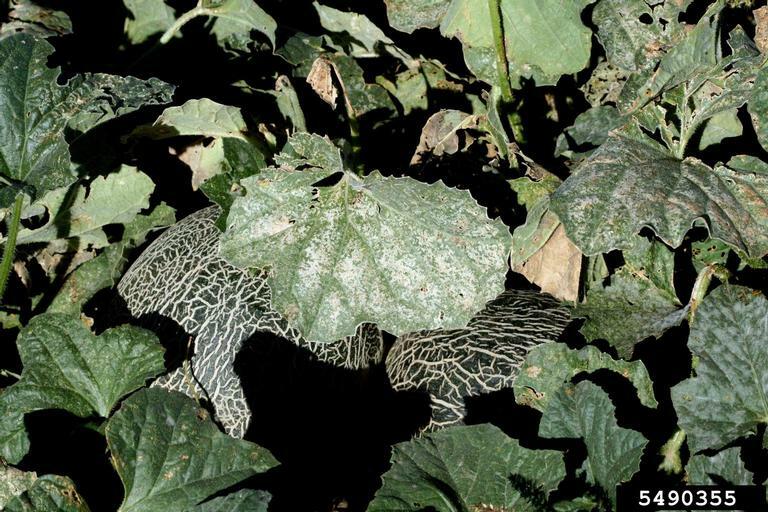 Verticillium wilt: Affects over 300 host plants, including cucurbits. Caused by soil-borne pathogens, these wilts are prevalent throughout the tropical and temperate regions of the world. They exist in the soil primarily as mycelia that infect below-ground plant tissue. High summer temperatures tend to halt development of the disease, but otherwise there is no cure for this disease. Diagnostic test for bacterial wilt. 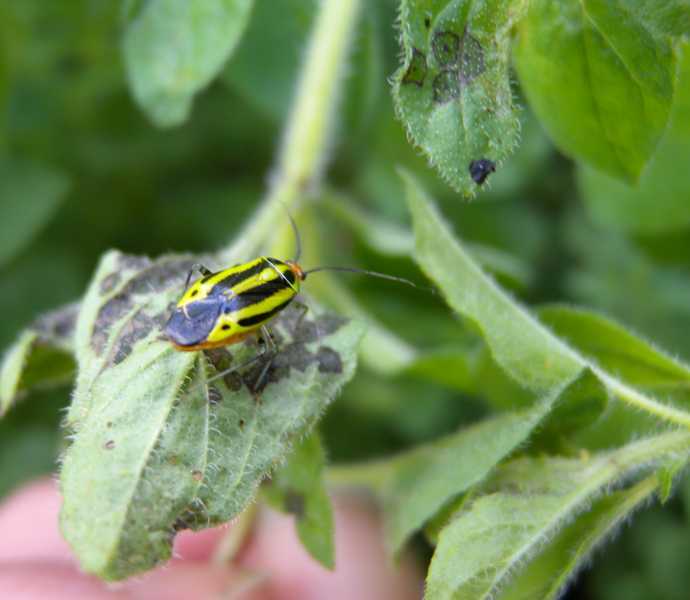 Infected plants initially show wilting and drying of individual leaves, especially those exhibiting cucumber beetle injury. As the leaves wilt and shrivel, stems may dry out suddenly. Later, wilting spreads to entire branches and vines. Wilting will occur during the middle of the day during periods with high water stress. The vine may recover at night. Eventually, however, the entire vine will wither, collapse, and die. 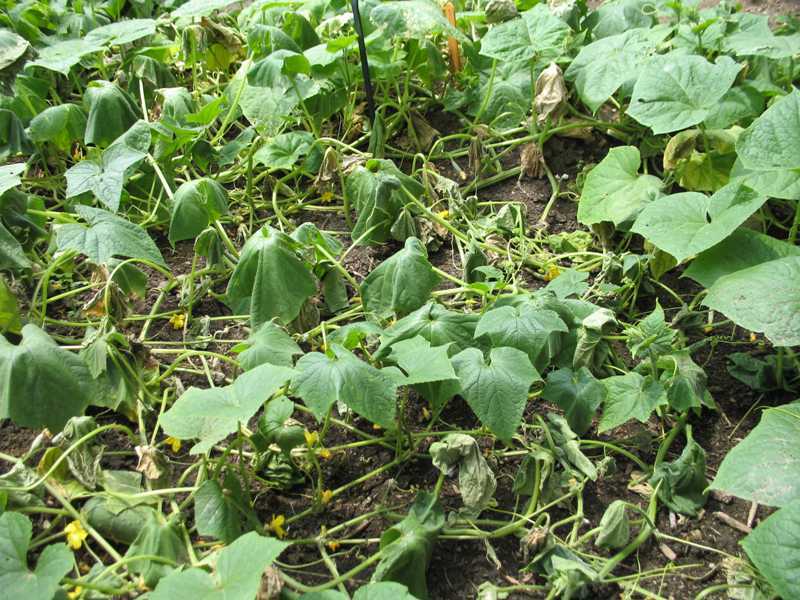 Cucumbers and muskmelons are more susceptible than pumpkins or squash; the disease is rarely a problem on watermelons. A good diagnostic test for this wilt is to cut a wilted stem near the base. Touch a knife blade to the cut and draw away from the cut. White to clear strings of the bacterial ooze will be strung out from the cut made on the infected plant to the knife blade. This diagnostic test is not 100% reliable. Further investigation may be necessary. Angular leaf spot of cucumber. This bacterial disease produces small, water-soaked spots on leaves that become tan on upper surfaces and gummy or shiny on lower surfaces. Spots take on an angular shape up to one-eighth of an inch. Later they dry and drop out. What to do: 1) Use treated seed. 2) Avoid excessive nitrogen. 3) Plant resistant varieties. 4) Rotate crops. 5) Tillage to bury crop residue. 6) Limit overhead irrigation and 7) Avoid working among wet plants.